September 1, 2007 – Norcross, Georgia, U.S.A. – The weather controls a great deal of the crop response to nitrogen. The contents of a new publication titled Managing Crop Nitrogen for Weather, based on the proceedings of a symposium at the 2006 meeting of the Soil Science Society of America (SSSA), provide details of experimental data and experiences of those engaged in efforts to improve prediction of crop nitrogen needs in response to weather conditions. 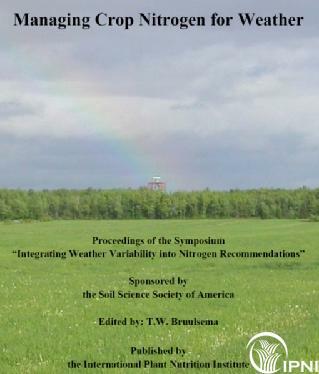 The papers contained in this new 132-page publication were originally presented at the Symposium “Integrating Weather Variability into Nitrogen Recommendations.” Thirteen of the original presentations from the Symposium are contained in the publication, plus abstracts of others. The authors are from several different countries and are recognized scientific authorities on their topics. The International Plant Nutrition Institute (IPNI) published the proceedings. “The task of applying models and methods to manage nitrogen application rate, timing, and placement in a manner that addresses the variability imposed on the soil-plant system by the dynamics of weather is a challenging one,” explains Dr. Tom Bruulsema, IPNI Northeast Region Director, of Guelph, Ontario. “It is hoped that this publication will be of use to those attempting to go further in efforts to integrate the data required to adapt crop nitrogen management to constantly changing weather.” Dr. Bruulsema served as Editor of the proceedings publication. Titles of papers in the publication include: Model-Based Nitrogen Fertilization Considering Agro-Meteorological Data; Nitrogen Management of Dynamic Simulation Modeling for Nitrogen Management in Maize; Optimum Nitrogen Rate for Corn Increases with Greater Soil Water Availability; Spring Rainfall Dictates Success of Nitrogen Applied to Corn in Fall or Winter; Dynamic Site-Specific Fertilizer Management Triggered by Real-Time Simulations and Weather Conditions; Optimizing Nitrogen Management for Rainfall and Maize in Africa; Growing Season and Soil Factors Related to Predicting Corn Nitrogen Fertilization in Quebec; In-Season Real-Time Plant Analysis for a more Flexible Nitrogen Recommendation System; Fifty Years of Predicting Wheat Nitrogen Requirements in the Pacific Northwest U.S.A.; A Water-Use-Based System for Deriving Nitrogen Recommendations in the Canadian Prairies; Exploring the Effect of Weather Forecast Accuracy on Nitrogen Fertilizer Recommendations; and The Challenge: a Research Agenda for Managing Crop Nitrogen for Weather. The publication is paper-bound, 8½ x 11 in., and contains some color. It is available for purchase from IPNI for US$50.00 plus shipping/handling. For more information, contact: Circulation Department, IPNI, 655 Engineering Drive, Suite 110, Norcross, GA 30092-2837 U.S.A.; phone 770-825-8082; fax 770-448-0439; e-mail: circulation@ipni.net. Contact: Tom Bruulsema, IPNI Northeast Region Director: tel. 519-821-5519; e-mail: tom.bruulsema@ipni.net.